VOLKSWAGEN, Europe’s biggest auto maker, has delivered an important boost to the FIA World Rally Championship by extending its involvement in the series until the end of 2019. Announcing the decision, Dr. Heinz-Jakob Neußer, Volkswagen Board Member for Technical Development and responsible for the brand’s motorsport program, praised the WRC’s global reach, popularity and unmatched consumer relevance. Volkswagen Motorsport has dominated the WRC since returning to the series at the start of 2013, winning the manufacturer, driver and co-driver championships, 16 rounds and 10 in a row up to last weekend’s Rally Italia Sardegna. Its previous commitment was to the end of 2015. 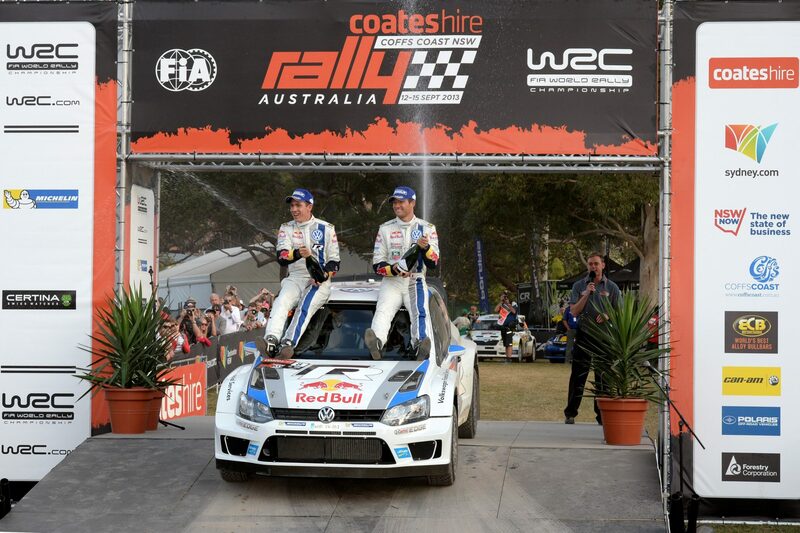 Frenchman Sebastien Ogier won the 2013 Coates Hire Rally Australia on his way to his maiden driver’s title and will return with the team of Polo R cars to the Coffs Coast next 11-14 September. “The FIA World Rally Championship is a very good platform for Volkswagen to demonstrate the efficiency, dynamics and reliability of its cars to a global public,” Dr Neußer said. “The series is more closely oriented towards the technology used in the latest production vehicles than any other world championship and based on the kind of real conditions that our customers all over the world experience on a daily basis. Volkswagen Motorsport Director Jost Capito said: “The Volkswagen Board’s decision to commit to the FIA World Rally Championship until 2019 makes us very proud. Volkswagen has never implemented a long-term motorsport program on this scale before. “This faith is a huge motivation for our entire team not to rest on its laurels for a single second, but to continue to show the same degree of passion, determination and commitment to ensure we remain successful in the World Rally Championship. Along with Formula One, the World Rally Championship is one of the most popular motorsport series in the world. It has been elite championship in rallying since 1973 and comprises 13 events held on four continents – on asphalt, gravel, snow and ice. WRC cars are based on production vehicles, with a 1.6-litre four-cylinder turbocharged engine and all-wheel drive. Although highly modified, they remain recognisable as popular showroom models and must be legal to drive on public roads. Volkswagen’s factory-team rivals in the WRC are Citroen and Hyundai, while Ford is represented by independent British team M-Sport. Former champion team Toyota recently has given strong hints it will return to the series in future years.